Motorola today announced that the Moto X, G, and E handsets can all expect to receive the Android 4.4.3 KitKat update in the days ahead. According to Motorola, the update brings a new dialer, several new theme colors, as well as stability, framework, security fixes, and enhancements to the power profile capabilities. The update also improves camera image quality for the Moto X, gives the Moto X and G the ability to pause/resume video capture, and gives the Moto X and Moto G access to the Moto Alert app. The system update is only available to the T-Mobile variant of the Moto X to start. Motorola didn't say when it will reach other vesions of the Moto X. The update is free to download and install. Motorola recently updated its camera application for the Moto G, Moto G, and several Droids. The app has a single new feature: users can now press the volume button to take a picture. The app is free to download from the Play Store. Aio Wireless today made three additional smartphones available to its prepaid customers. The devices, all of which have been available from other carriers for some time, include the Motorola Moto G for $149.99, the Nokia Lumia 520 for $99.99, and the ZTE Sonata 4G for $79.99. The Sonata reaches Aio Wireless stores today, but the Moto G and Lumia 520 won't be available until February 14. Motorola today updated the Gallery application that's installed on its Android smartphones. The app has a refreshed design that offers larger thumbnails and faster, simpler navigation between galleries and photos. The Motorola Gallery, which is free to download from the Google Play Store, is available to devices running Android 4.4 KitKat, including the Moto X, Moto G, and the Droid Ultra, Droid Mini, and Droid Maxx. Motorola has added a third option for people looking to customize the look of their Moto G with new Grip Shells. 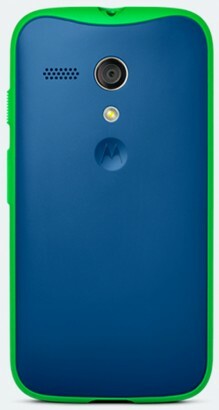 The Moto G, which can be ordered directly from Motorola's web site, comes with a black rear cover that can be swapped with a number of different rear shells. The standard Color Shell costs $15, the new Grip Shell costs $20, and the Flip Shell costs $30. Each of the shells is available in a half-dozen colors. The Grip Shell, in particular, is a bit more ruggedized than the others and includes a bumper for protection. 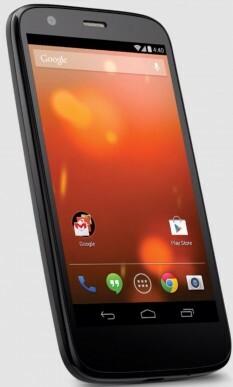 Google today added the Motorola Moto G to the Google Play Store as a Play Edition device. The G, which has a 4.5-inch 720p HD screen, 5-megapixel camera, and 1.2GHz quad-core Snapdragon 400 processor, is being sold unlocked and contract free for $179 (8GB) and $199 (16GB). The Moto G runs a stock version of Android 4.4 KitKat. Of note, the Moto G supports HSPA+ networks, but not LTE 4G. It is available beginning today. 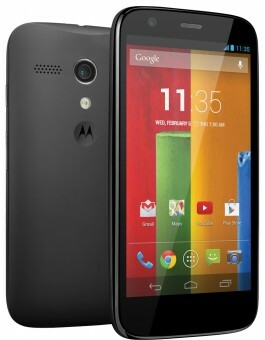 The Moto G is available for the same price from Motorola's web site. The phone is also being sold at a discount from several wireless network operators, including AT&T, Boost, and Verizon Wireless. Motorola has made the Android 4.4.2 system update available to the Moto G. The update installs a new phone dialer, makes performance enhancements to the camera application, adds photo-editing options to the gallery app, adds support for printing via Google Cloud Print, adds the latest version of Hangouts for use with SMS, and makes the G compatible with Square credit card readers. The update can be installed on all versions of the G.
Motorola has provided an update to its camera application for Android devices. The camera app, which is the one that comes on the Moto X, for example, now lets users control focus and exposure manually by dragging the focus ring around the viewfinder. The app now locks exposure during panorama capture and adds more languages. The update also fixes several bugs. The Motorola camera application is free to download from the Google Play Store. Motorola today made the Moto G Android smartphone available for sale through its web site. Consumers can buy the device directly from Motorola. The Moto G costs $179 for the 8GB model and $199 for the 16GB model. The Moto G was announced earlier this month. It has a 4.5-inch 720p HD screen, quad-core Snapdragon 400 processor, and 5-megapixel camera. The Moto G ships with Android 4.3 Jelly Bean, but it will be updated to Android 4.4 KitKat early next year. Motorola is selling the unlocked GSM model only. Wireless network operators will sell the CDMA variant in January. Verizon Wireless today said via its official Twitter account that it will offer the Moto G beginning in the first quarter of 2014 through its prepaid service. Motorola today announced the Moto G, a device that Motorola says delivers a premium experience at one-third the price of today's flagship devices. The Moto G resembles the Moto X, which Motorola released earlier this year, but is more affordable and targeted at consumers who are on a budget. It has the same curved back, Gorilla Glass, and waterproof nano-coating to protect the internal components from moisture. The screen measures 4.5 inches and includes 1280 x 720 pixels. The G is powered by a quad-core 1.2GHz Snapdragon 400 processor with 1GB of RAM and has a 2,070mAh battery. In includes a 5-megapixel rear camera and 1.3-megapixel front-facing camera. The device ships with Android 4.3 Jelly Bean and Motorola is guaranteeing an update to Android 4.4 KitKat. 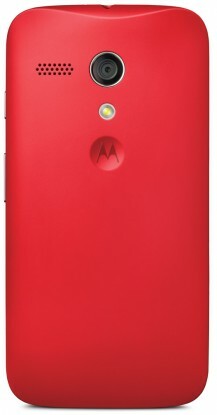 Unlike the Moto X, the Moto G has removable back covers, which can be interchanged for customization. Motorola is selling the unlocked 8GB Moto G on its web site for $179 and the 16GB version for $199. The device goes on sale in Brazil and select European markets this week, with other Latin American and European markets to follow several weeks later. The Moto G won't be available in the U.S. until January 2014.